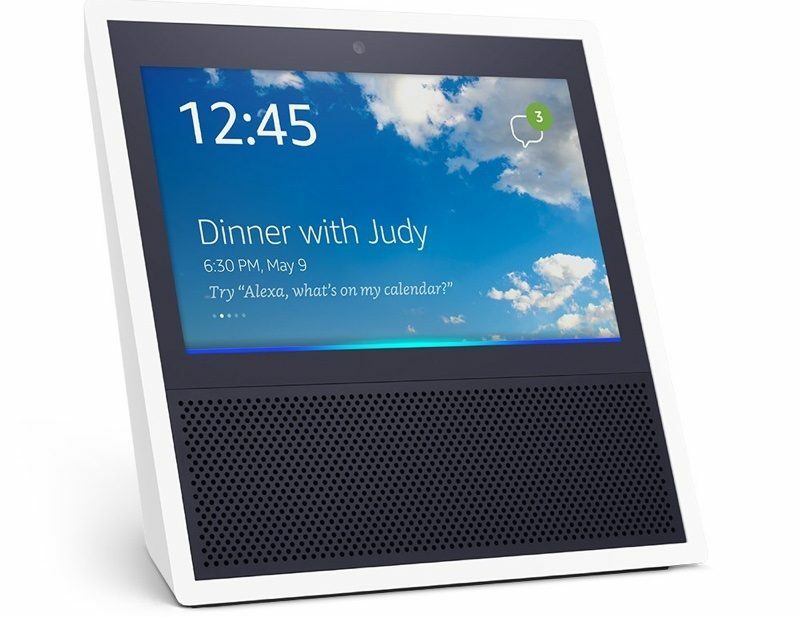 With Amazon having launched the Echo Show, a new Alexa-enabled smart speaker that comes equipped with a 7-inch screen, Bloomberg has shared a little tidbit on Apple's own speaker plans, making it clear that there's still no concrete information on whether Apple's speaker will include a display. In a piece outlining Amazon's new speaker, Bloomberg references a comment made recently by Apple marketing chief Phil Schiller, where he said that a voice assistant in a device without a screen doesn't "suit many situations." While marketing chief Phil Schiller recently talked up the benefits of having a screen on a voice-activated device, it's not clear whether the Apple version will in fact have one. Rumors of Apple's work on some kind of in-home Siri-based smart speaker to compete with the Amazon Echo first surfaced in early 2016, but while the speaker is said to be close to launching, details remain scant. We've heard it will feature Siri integration and focus heavily on sound quality, with "excellent acoustics performance" and some form of Beats technology. Design details shared in late April said it would feature a Mac Pro-style concave top with built-in controls and a "fat" body with speaker mesh covering the majority of the device, but no display was mentioned. KGI Securities analyst Ming-Chi Kuo has said the speaker has a 50 percent chance of debuting at Apple's Worldwide Developers Conference coming in June, and as Bloomberg first mentioned in September (and reiterates again today) the speaker is currently being tested within the homes of Apple employees, so it may not be long before we have more concrete details about the device. Based on today's Bloomberg report, Apple's speaker will have one benefit over the Amazon Echo and Google Home - native Apple Music integration. Amazon devices chief Dave Limp told Bloomberg that while Amazon would "love to have Apple" the company is "not super big" on allowing Apple Music integration. For more details on Apple's upcoming Siri speaker, make sure to check out our dedicated roundup, which aggregates all of the information we've heard about the device so far. More information about Amazon's Echo Show can be found in our launch article. I don't see the point of the screen unless it's $99 or so. The Echo Show, at $229, is nothing more than a severely limited tablet with a stand built into it. It's just too expensive for what it is. As others have alluded to already, I don't see the point of a screen for a Siri speaker with a screen. That's why I have a screen on my iPad, iPhone and Apple Watch. Why would I bother to walk over to see a screen on a speaker? I thought the whole idea of the speaker was so that I wouldn't have to walk anywhere. I can just as easily walk over and pick up my smartphone or tablet if I need to look at something. I already have a speaker with a screen on it. It's called a television. What if he's still saying the truth. You: what's the weather today? Apple Home Device: (Voice) It will be 72 degrees today. Iphone: Screen lights up immediately on your iPhone / iPad what ever is being used showing the weather and other contextual information. Your iDevice can now extend and act as the "screen" to the Apple Home Device for further reading and interaction. A smart speaker , I think that's enough smart things ( says the guy who will probably get it ) but isn't this gonna be like an old iPad just sitting in the living room ? I'd probably rather have an Amazon version over an Apple version of something like this. Ordering stuff direct from Amazon with a voice command is huge, and more practical for a device like this where it's likely situated in the kitchen or living room. Dear Apple Please do not copy that "Ugly overpriced Thing"... thanks! I'm just wondering what the sound quality will be like after Ivie makes the speaker and screen only 3mm thick. No, it's not. It also is definitely not a tablet and it doesn't want to be one. Watch the video that Amazon made for it. Normal people in their every day life using this device for EXACTLY what normal people in their every day life would want to do with such a gadget -- when their hands are busy doing chores, working in their homes or changing their babies' diapers. The way Amazon lets them use the screen MAKES SENSE and actually is helpful -- beyond the scope of what a tablet could do in any of these situations. Amazon "got it". And yes, I will buy one of those gadgets, too, the moment they become available in Germany. Good luck with using that combo without your hands. I think the 'Show' looks like a great device that will fly off the shelves. No doubt it will be $199 after promotions, Black Friday etc. The fact that the 'Show' works with existing Dots and Echos for voice call will make this a 100% success IMO and save folks with long distance landline calls - cancel your phones landline, just have broadband. Amazon got it nailed. They focused on the things where a screen can actually add value to Alexa, and they made it work. And at this price -- especially since you can get two devices for a significant rebate (just to push the video call feature) - this thing will sell itself (at least in first world countries). Oh... And then there still is the fact that this platform is entirely open for third party developers and everybody can develop "skills" for Alexa with almost zero investment. Why is everyone acting as if Apple does NOT have an iPad in their line up? Add a wall mount and what else do you need? Speakers? They got that nailed wirelessly I believe? I don't understand this selective blindness going on in the Apple press? The iPad has 1 microphone, the Echo Dot has 7 the Echo show has 8. I think this is why Siri is not as acurate as we would all like. oh look, amazon released a desktop phone to complete against the iPhone. It seems to do less than the iPhone although the personal assistant is better.